I know I know, it’s spring, we should be talking about grilling and salads and lots of fresh vegetables, right? Well, I agree, but today a cold front moved in and brought some wind and the prediction of snow in the mountains so I decided to make some soup… Plus, it’s easy to share with friends and that is exactly what I plan to do! You might just be the recipient of a free dinner tomorrow! Melt the butter in a soup pot. Saute the onion until it is softened. Blend in the flour and then gradually stir in the chicken broth. Stir constantly until it comes to a boil, keep stirring for one more minute. 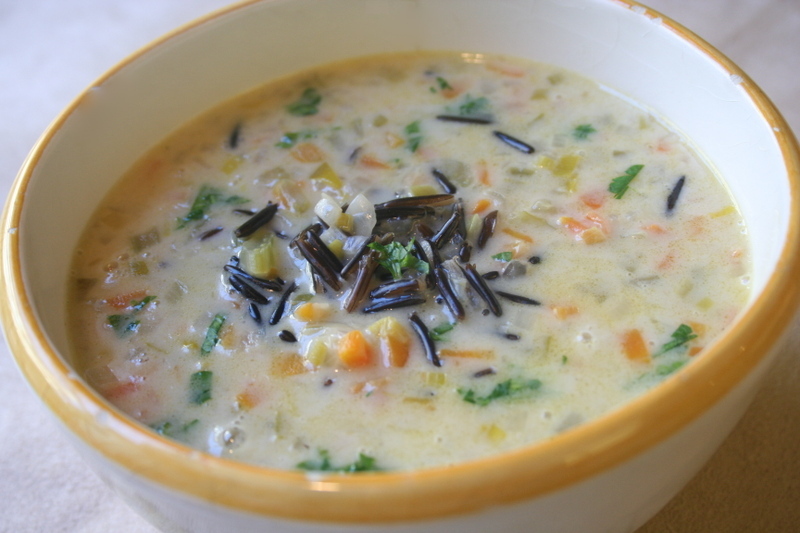 Add wild rice, chicken, celery, carrots, almonds, salt and simmer about 5 minutes. Add half-and-half and sherry, heat until just heated through. Garnish with chopped fresh parsley or chives.